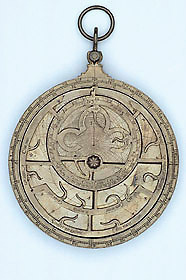 Some unusual features of this astrolabe have led to doubts being cast on its authenticity. Some of its features seem medieval, but the engraved letters are in a later style, which itself is not standard throughout. The rete is made from a rather thick brass plate and has been incorrectly divided. However, it can be difficult to distinguish between a fake instrument, one that is the work of a non-commercial and eccentric maker, and one that has later additions. Although puzzles remain with this instrument, it is probably not straightforwardly a counterfeit.